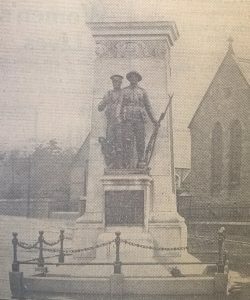 While working on behalf of Larne Urban Council, WW1 Research Ireland has recently discovered that names were missing from Larne Urban District’s War Memorial (Inver Park). Extensive research has produced a list of 97 additional names. Verified names will be added to the War Memorial by November 2018. Consultation THIS CONSULTATION IS NOW CLOSED. From 9 April – 27 April 2018 we are inviting the public to examine the lists of names provided below and advise us if there are any other names that should be considered for inclusion. This consultation deals only with the ‘Fallen’ and is NOT a collection of names for a ‘Roll of Honour’. (1) Those who were born or resided in the Larne Urban District Council area. A map of the Larne Town is available HERE. Source: In the Parliament of Northern Ireland Session 1930, Larne Urban District Council Bill. Extension of Boundary, present boundary inlined – Red. (PRONI: LA/43/8/JA/48). This will be used in conjunction with street names for “Larne Urban” in 1901 Census of Ireland and 1911 Census of Ireland. (2) The period for inclusion is between 4 August 1914 – 31 August 1921. (3) All military personnel qualify including the Mercantile Marine and Nursing Corps. Should you consider, after looking at the set criteria and the Fallen list, that your forebear is missing from this list, and you wish them to be considered for inclusion on the Larne Urban District Council War Memorial, please complete THIS FORM with as much detail as you can. This will enable History Hub Ulster to verify the name supplied. THIS CONSULTATION IS NOW CLOSED. Your personal information will be shared between History Hub Ulster and Mid and East Antrim Borough Council and will be used for the purpose of verifying the historical data provided and only used with your consent. 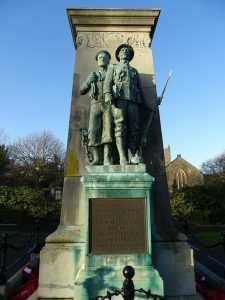 Please be aware that by providing us with the military personnel information you are consenting for this data to be held and used, not only for the purpose set out above, but in future Mid and East Antrim Borough Council publications, websites, presentations or other projects associated with The Great War. For those who would prefer to submit their information in person two public drop-in sessions will take place on Tuesday 17 April and Saturday 21 April 2018 between 10am and 1pm in The Town Hall, Larne.